Quite a few of our wedding couples bring along some family members and friends to be present for their special day. Most groups visiting Anse Chastanet and Jade Mountain are between 6-36 guests in size, but sometimes bigger. The bigger the group the earlier you should start planning your elopement. Our minimum stay requirement is 3 days for wedding guests and 5 nights for the bride and groom. 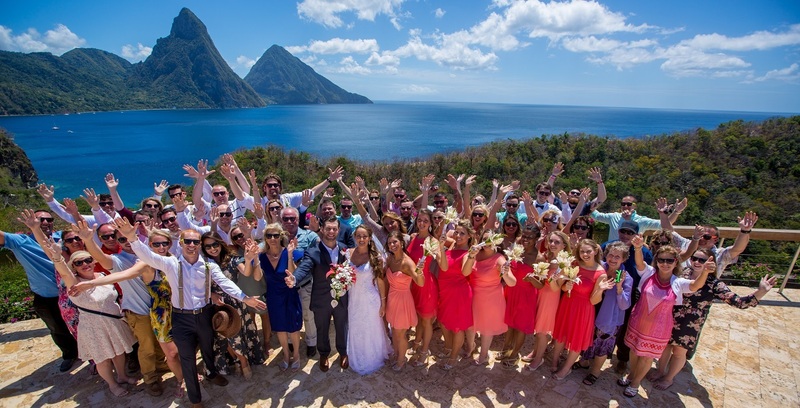 While Anse Chastanet can comfortably cater to groups up to 100 guests, we set the limit for wedding groups at Jade Mountain to approximately 36. If you are planning to bring any size group, please contact us so that we make you an offer tailor made to your specific requirements. If you wish, we can also arrange activities before and after the wedding ceremony or wedding day for your group, such as rain forest hikes, boat shopping trip to the Capital or duty free area, boat leisure trips, deep sea fishing trips and sunset cruises, to name just a few. As you could probably see from our resort promotions at ansechastanet.com and jademountain.com, there is a variety of rates and packages to choose from. Most popular with honeymooners and wedding couples is our Total Romance Package - this is an all-inclusive package. If you book at least 3 months ahead of time, a 7th night free may be applicable. There are also special free night summer promotions and sometimes, free wedding promotions. Bride and Groom travelling with a group consisting of a minimum of 5 rooms (including their own) will receive a complimentary room upgrade from us, from one room category to the next. In addition, we usually offer special rate discounts to the bride and groom and also the wedding guests over our published rates. Most wedding party guests prefer to book a daily rate rather than a package rate. In most cases, the bride and groom first book and secure with a deposit their own room, reserve their preferred wedding date and then ask us to hold a certain number of rooms for them. This can be done without an initial deposit as long as the reserved date is at least 3 months ahead. The bride and groom then inform their potential wedding guests of the rates and advise them to book directly with the Resort or through our 1-800-223-1108 toll-free number, or through their favorite travel agent. In order for your guests to obtain the discounted rate they would need to refer to your wedding (name of bride and groom is usually used). There are many different locations available on our 600 acre estate for the actual wedding ceremony to take place. Please see our locations section for details. Some groups like to have a champagne toast as part of the ceremony in which case we usually let you choose the champagne from our wine list. Please see our wining and dining section for details. Other groups prefer to have a cocktail reception after the ceremony. The prices for this differ depending on the variety of drinks and the amount/variety of hors d'oeuvres you wish to make available to your guests. Please see our wining and dining section for details. For wedding groups of more than 12 guests, we can make private dining space available exclusively for your group festivities and dinner. For the exclusive use of one restaurant or specific dining area, surcharges apply for extra staff requirements and set up. Basic table decoration is included. Elaborate table flower decoration would be charged extra. Please see rates page for details. Your exact dinner requirements can be completed in discussion with our Executive Chef. We have some wedding menu suggestions which can be downloaded from this page below. Wines are charged and can choosen from our wine list, or we provide an all-inclusive price for dinner and house wines. Our wining and dining section shows sample menus. Most couples choose to have live entertainment. See our entertainment section for details. We would be more than happy to provide further details. Please contact us. Our wedding team would be delighted to assist you in tailor-making your destination wedding for you and your guests to fit everyone's budgets. The formal, legally binding part of the wedding ceremony must be conducted by an officiant of the Government of Saint Lucia. It is possible, however, to have your Minister partake in the celebration once the legal part of the ceremony has been concluded. Can I get married at sunset? Actually, in order for the civil wedding to be legal, it must be conducted and finalized prior to sunset. Therefore, most of our weddings take place between 4- 5 p.m.
Can you arrange a Catholic Church wedding? As per resort policy, Anse Chastanet accommodates children from age 6 and Jade Mountain from age 15. 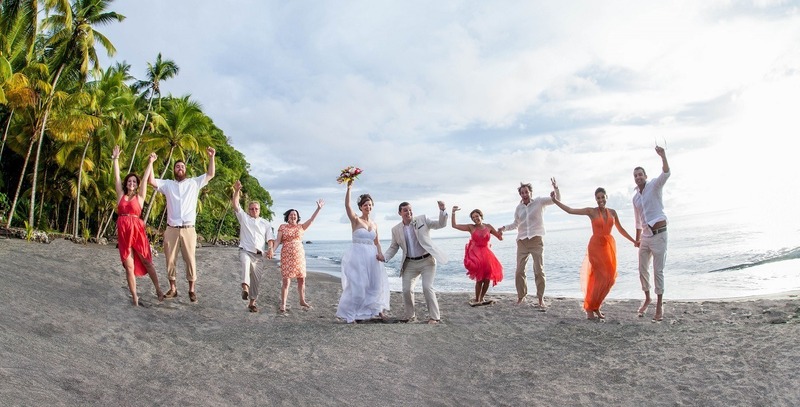 Please know that in connection with wedding groups, Anse Chastanet will accept younger children, but the age minimum remains at 15 at Jade Mountain. Can young children attend my wedding celebration at Anse Chastanet or Jade Mountain? There is no age limit for children to attend a wedding at Anse Chastanet. There is a strict age limit for children at Jade Mountain. Children under the age of 10 years will not be given access, for safety reasons (and children must be 15 years and older to actually reside at Jade Mountain). We are able to allow children over the age of 10 to attend a wedding celebration at Jade Mountain but ask that the children are closely supervised at all times. Must all our guests stay at Anse Chastanet or JADE MOUNTAIN? We suggest that at least 50% of your wedding guests stay here with us, especially for large groups of 30 and more guests. We are not always able to guarantee exclusive usage of one of our restaurants if guests stay elsewhere. It is important to communicate this to us. Non - residents guests can of course attend wedding celebrations and they will be charged a set price for food and drink depending on what was chosen. This is particularly important if the group size is over 24 guests. Bride and Groom travelling with a group consisting of a minimum of 5 rooms (including their own) will receive a complimentary guaranteed room upgrade. Special group rates may apply. For planning purposes and logistical reasons we expect a minimum 50% of all guests to be accommodated at Jade Mountain or Anse Chastanet. This is particularly important if the group size is over 24 guests. If your guests are not staying at Anse Chastanet or Jade Mountain, this may create challenges in regard to availability of catering venues. Who will help us arrange our wedding? Wedding groups will not only be assisted by the wedding coordinator, but by the entire management team. In addition to the wedding coordinator, the resort managers will assist depending on the individual needs of each of our wedding couples. Prior to your arrival, we have a dedicated pre-arrival wedding concierge stay in touch with you. What about Jewish, Hindi or Muslim weddings? There are no resident officiants for these 3 religious groups but can be found on neighboring islands and be asked to fly in (at a charge to bride and groom). While they may partake in the ceremony, the civil part of the wedding would still need to be conducted by a Saint Lucia Government appointed officiant.